The 12 V lead-acid battery system has met its match. 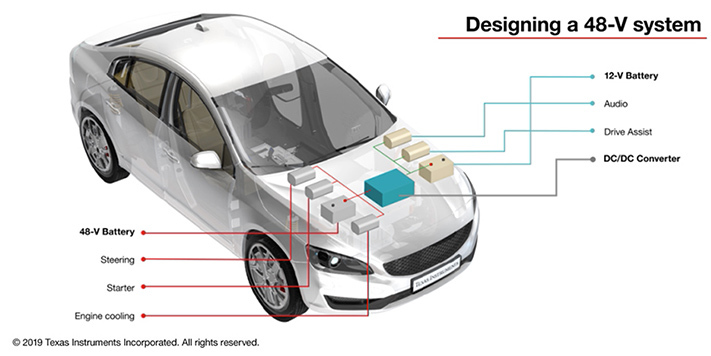 With increasingly strict emission regulations, growing power load requirements of advanced automotive electronics and the conversion from mechanical components to electronic functions, the traditional automotive battery of choice has reached its current-carrying capacity. In response, automakers and their suppliers have developed a second, additional electrical system at 48 V which delivers more power at lower currents than a traditional 12-V battery can produce alone. 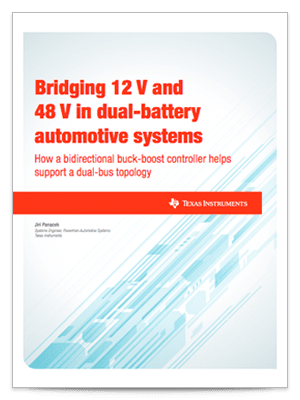 In the white paper, Bridging 12 V and 48 V in dual-battery automotive systems, I explain how a bidirectional buck-boost controller helps support a dual-bus topology. You can also go straight to the reference design, Bidirectional DC-DC Converter Reference Design for 12-V/48-V Automotive Systems.